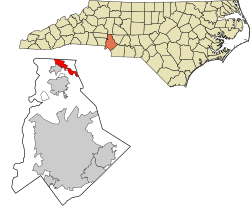 Is a lakeside town on Lake Norman in northern Mecklenburg County in the U.S. state of North Carolina. The town is just south of Mooresville which is considered Race City USAThe population was 10,944 at the 2010 census. It is home to Davidson College. The town is centered on the college from which it takes its name. The citizens here attend the Charlotte-Mecklenburg Schools. Charlotte-Mecklenburg Schools have proposed expanding the nearby Elementary to a K-8 school. High school students attend William A. Hough High School, also in Cornelius. The College is a highly selective liberal arts college located in the heart of town on Main Street and has been ranked the 3rd most rigorous school in the United States, the top school in the south, is consistently ranked in the top ten best liberal arts colleges in the country, and has graduated 23 Rhodes Scholars.